In late summer 1904, Levi Stanely escorted his ailing wife from their home in Oklahoma to Plainville, Kansas where two of her sisters lived and could provide her with care. Lucinda (Dornon) Stanley's mental health was failing. 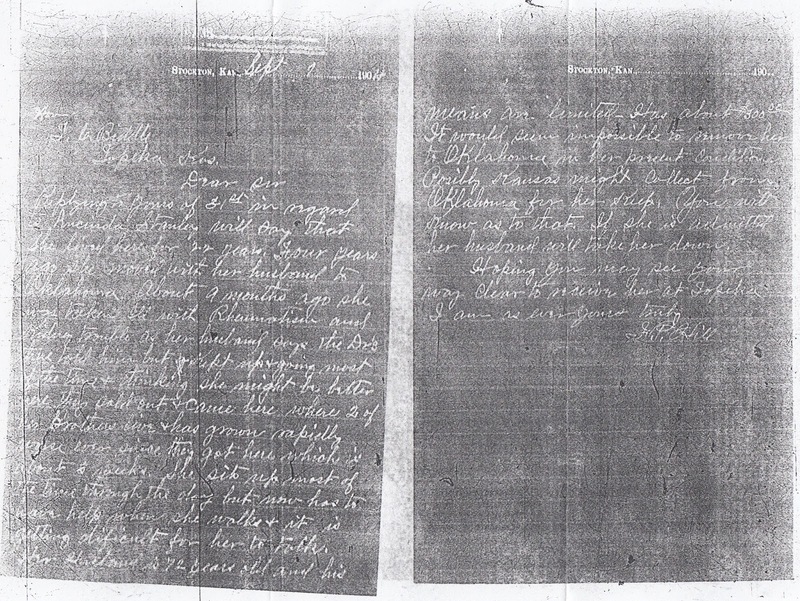 A probate judge, doctor, and jurors examined and declared Lucinda mentally incapacitated and made arrangements for her immediate treatment at the Kansas State Insane Asylum in Topeka. Over the course of several short weeks, her health declined precipitously. Just one week after being admitted to the hospital, Lucinda was dead (see Examined and Judged Insane). 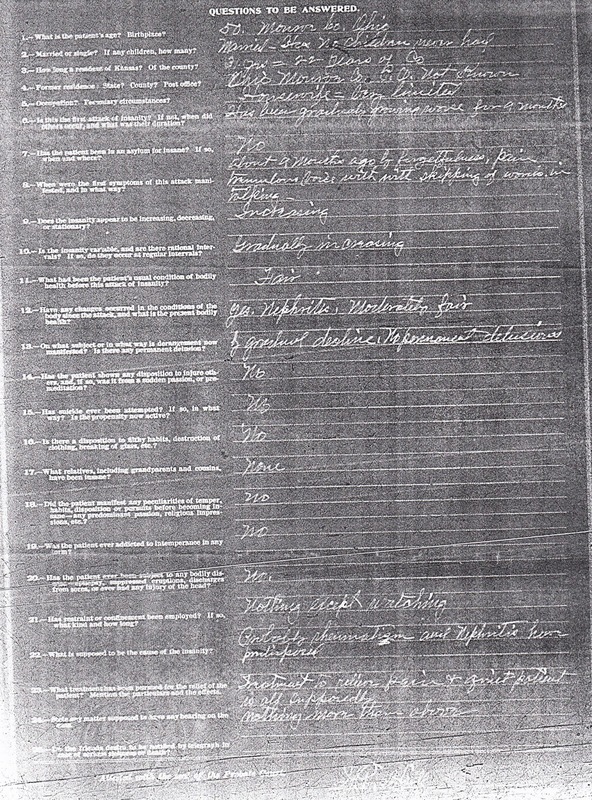 The Kansas Historical Society holds microfilmed copies of medical records from the Topeka State Hospital (the later name of the State Insane Asylum). Privacy restrictions prohibit anyone reviewing her medical diagnosis, but four pages from her file survive and are now public record. Regrettably, the original medical records were destroyed, so the grainy microfilmed copies must be relied on to detail Lucinda's harrowing final days. 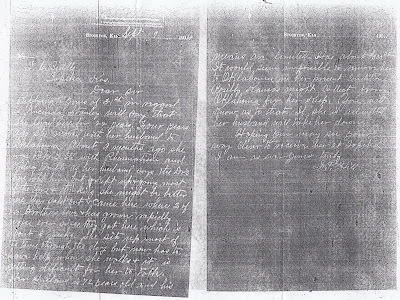 On September 1, 1904, Rooks County Probate Judge Hill wrote to the State Insane Asylum to inform them of Lucinda's fragile condition, and petition for her treatment at the facility as a ward of the state despite her Oklahoma residence. Replying to yours of 31st in regard to Lucinda Stanley will say that she lived here for 22 years, four years ago she moved with her husband to Oklahoma. About 9 months ago she was taken ill with rheumatism and kidney trouble as her husband says the Dr's had told him but kept up and going most of the time thinking she might be better if they sold out and and came here where 2 of her brothers live and has grown rapidly worse since they got here which is about [illegible] weeks. She sits up most of the time through the day but now has to have help when she walks and it is getting difficult for her to talk. Her husband is 72 years old and his means are limited. Has about $300. It would seem impossible to remove her to Oklahoma in her present condition. Possibly Kansas might collect from Oklahoma for her keep. You will know as to that. If she is admitted her husband will take her down. Hoping you may see your way clear to receive her at Topeka. I am as ever yours. Truly, J.P. Hill"
The second record is a questionnaire requiring 25 responses regarding the patient's background and condition. There are genealogically relevant responses. 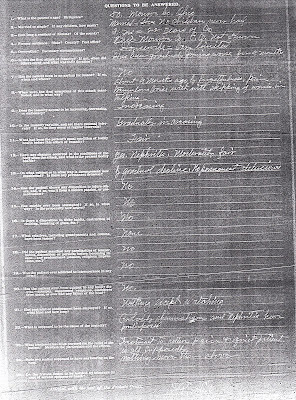 For example, the questionnaire confirmed Lucinda's age was 50 (indicating her birth year was about 1854) and that she was born in Monroe County, Ohio. The questionnaire points to a continuing mystery. It confirmed that she was married, but stated that she "has no children never had". Previously it was believed that she had a daughter Ella with her first husband Sylvester Scannel, both of whom pre-deceased her. This requires further investigation. The questionnaire also addresses her current medical condition. Her first symptoms included "forgetfulness, pain, numbness...skipping of words in talking..." and she "has been gradually growing worse for 9 months". Lucinda's health before this attack of insanity was considered "fair". This was the first time she had been admitted to an asylum for insane. The third record is a patient enrollment form. It's a sweeping collection of information on her background and current medical affliction. 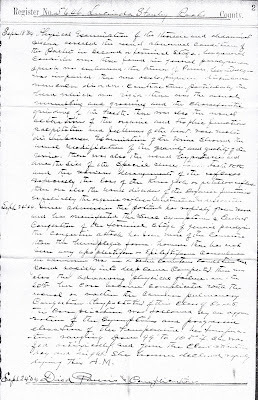 "Admitted September 17, 1904. Native of: Ohio. Age: 50. Class: State. Marital Condition: Married. Children: none. Occupation: housewife. 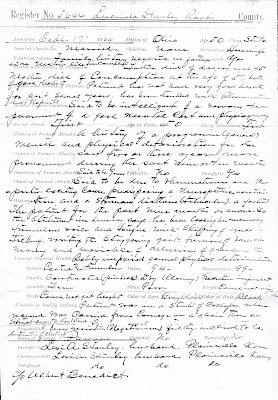 Relatives insane: Family history negative [illegible]. Temperate: yes." And it continues on for more than a dozen questions. 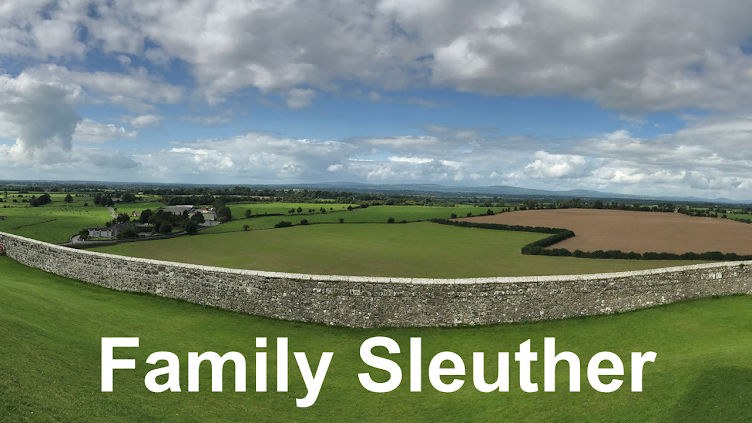 But, in an unanticipated surprise, the form provided information on Lucinda's family history. "Health and Habits of Parents: Father died of dropsy aged 45. Mother died of consumption at the age of 57. Both of good habit." Lucinda's parents, Burr Zelah and Sophronia (Rogers) Dornon, were my fourth great-grandparents. I have been researching Burr Zelah for years, trying to learn about the circumstances of his death during the height of the Civil War. I was primarily researching Lucinda - an aunt and not my direct ancestor - in the hope that I would uncover documentation about the circumstances regarding Burr's untimely death. I was so fully engrossed in Lucinda's unfolding medical emergency that it took me a minute to grasp that I had just glanced over the cause of both Burr and Sophronia's deaths. Apparently, Burr wasn't killed in battle or as a result of conflict with invading Confederate soldiers (as I speculated). 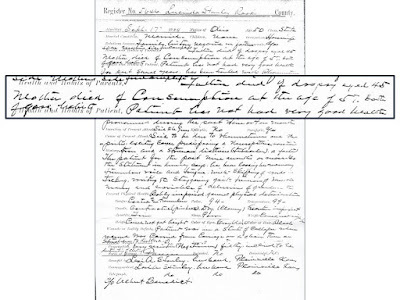 His cause of death - dropsy - is an old medical term that, according to Access Genealogy, is "an abnormal collection of fluid in the tissues and cavities of the body; edema (swelling), often caused by kidney or heart disease." In an instant I was handed information that I had long hoped would surface. While questions remain about the circumstances that led to his early passing from dropsy, it's gratifying to have something - anything - acknowledging his death. It's a lesson for genealogists that exhaustive research, following collateral lines, can and does provide answers. 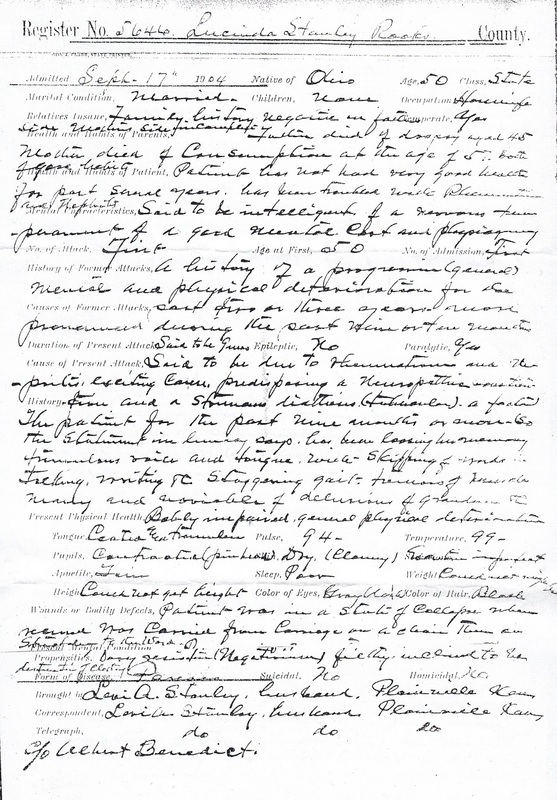 The final record in Lucinda's medical file is a handwritten summary of her condition documented on two days. On September 18, 1904, a physical examination was conducted. It found that her head "was rigid...there was the unusual mumbling and groaning and the characteristic grinding of the teeth..."
On September 24, 1904, her heath deteriorated. 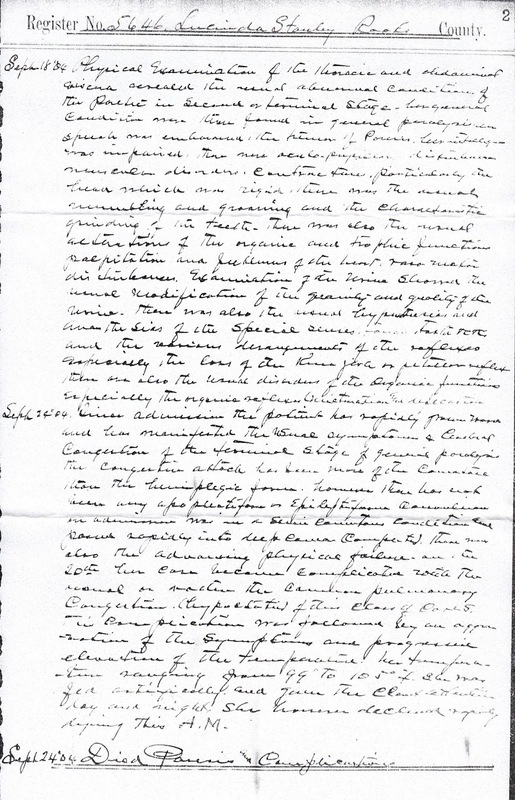 The notes flagged a "progressive elevation of the temperature... ranging from 99 degrees to 105 degrees F. She worsens declined rapidly during this A.M."
A final terse note also dated September 24, 1904, concluded: "Died Paresis and Complications." That was Lucinda's swift end - a lapse into insanity silenced by muscle weakness and associated complications. From her tormented final days, Lucinda left a medical history that addressed the circumstances of her father's untimely passing. For me, this was genealogy gold. But it's difficult to shake Lucinda's legacy. An unknown and largely forgotten member of the Dornon family, I can't help wondering if she was a secreted away memory only ever discussed in hushed whispers. Was the family afraid of how her final illness would be perceived? Generations later - without any surviving descendants of her own - she was largely forgotten. It seems only fitting that her life's story would hold part of the long-sought-after answer to her father's passing. 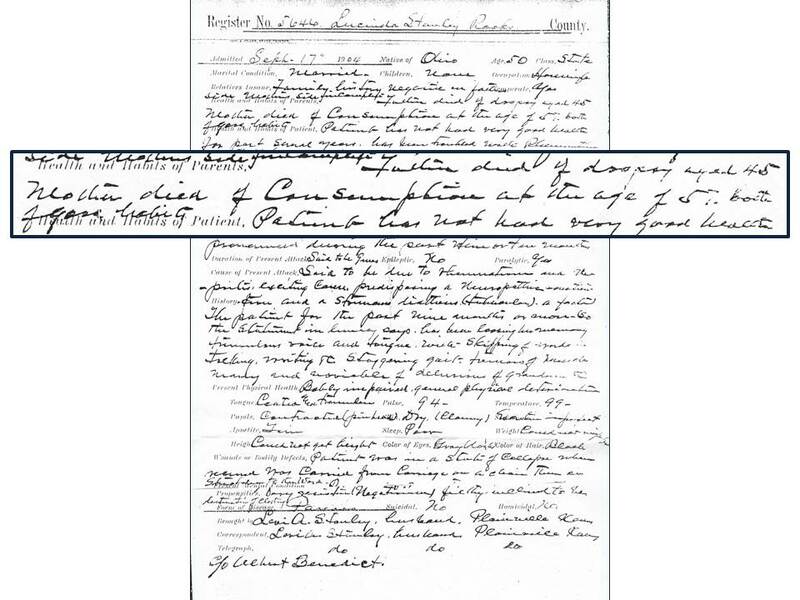 This makes me hope that one day I might find a document which supports or refutes the family tradition of my 3rd great-grandfather William A. W. Dempsey's death in a logging accident. Great sleuthing, Michael. I'm rooting for you - hoping that the answers you seek regarding William A. W. Dempsey's death will surface. I'm wondering how one goes about againing access to mental health records? I suppose each state is different. I think it mostly depends on the repository that has them. In this case, I was fortunate that Lucinda was committed to a state institution - I think that played a role in the Kansas Historical Society receiving the records into their archives. These types of commitments typically require a court mandate, so you may want to first start in the relevant county to see if there was a judgment for a commitment (Lucinda has one and I still need to obtain that from the courthouse). Ultimately, I recommend tapping into the knowledge of local archivists and librarians. They know their collections best and can often guide your sleuthing. Good luck, Nancy! I agree---doing research on collateral lines is incredibly worthwhile. I am so glad you found that record. What haunts me about Lucinda is the cause of her conditions. It sounds like this was something other than mental illness with all those symptoms. I'd ask a doctor how one might diagnose her condition based on those symptoms in today's world of medicine. I saw a reference to her kidney in one of these documents or a newspaper clipping (can’t remember which at the moment), which made me think of that film “The Madness of King George” about his bouts of insanity due to some kind of blood disease. Have you seen that film? I wondered if it was a similar ailment. I don't know the film. But there just does seem to be more going on here than mental illness. If you have any doctor friends, I'd run it past them. Great finds, and I love that someone who was silenced by her family spoke to you after 114 years. It is pretty special when you put it like that!